Try Refillable Ink Cartridges with your Epson Photo RX500 and make 30 times more quality prints for the same money! Pay only 0.04 USD for A-4 full color print! The refillable ink cartridges for Epson Photo RX500are made similar to original cartridges; however they have auto-reset chips which allow adding ink in each cartridge again and again, up to several hundreds of times. These cartridges are easy to refill, there is no need to remove the cartridges from the printer. 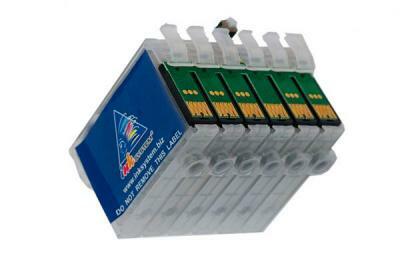 The cartridges are made of high-quality plastic, and can be changed on their positions that easily allow to alter them from one model to another or to replace the damaged cartridge.